Australian Birdkeeper Publications: ABK Publications produces the very best and most diversified avian magazine, Australian Birdkeeper, the world acclaimed colourful and informative 'A Guide to....' series books and the Handbook of Birds, Cages & Aviaries and supply a comprehensive range of avicultural titles, videos and t-shirts. Ph: 07 5590 7777. Bazza Birds: Supplier of brooders Ph: 0407 559 878. Robert Collier: nest boxes, feed bins, aviary accessories. Ph: 0746347220. Borg's Brooders: Ph: 02 42715006. John Galea: PVC nest boxes. Ph: 02 96202089. Ken Yorke: Bird Software Programs Ph: 02 49886539. Matt & Cheryl Bryant - Profowl Grains: Seller of finch, budgie, parrot mixes as well as straight grains Ph: 0428 437 276. Nature's Nests: Nesting Logs. Fred & Jo Bartyn Ph: 02 68921071. 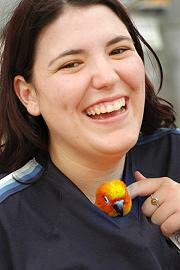 MDS Australia: Bird Sexing 02 62997740. Phil Brauer: Nest Boxes. Ph: 07 32007351. Ray Cutter: Aviary accessories. Ph: 07 55450194. Vetafarm: Australia's primary avian health care company with a product range which includes over 300 products for many species of animals, from pharmaceuticals to nutraceuticals, animal foods, veterinary equipment and diagnostic kits. Ph: 02 6925 6222. Peter Slade: Seed Mixes Ph 02 67474813. New trade stands interested in attending phone Dave 02 67441179.